SCARBOROUGH, ENGLAND (June 11, 2015) — It is always useful when doing paleontological fieldwork to visit the local museum to see what specimens they’ve curated over the years. Today Team Yorkshire explored the collections at the Scarborough Museums Trust Woodend storage facility, courtesy of Jennifer Dunne, Collections Manager. 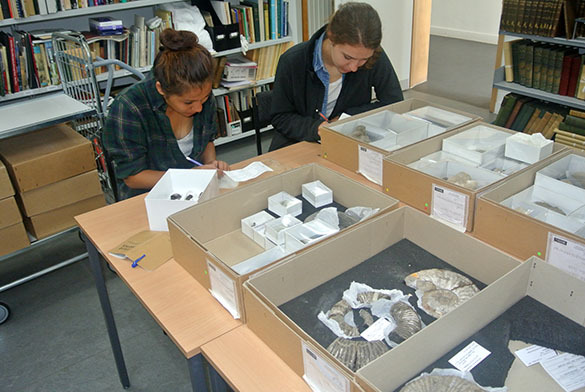 Above are Mae Kemsley (’16) and Meredith Mann (’16) examining boxes of specimens from the Speeton Clay and Coralline Oolite, the two units they’re working with. 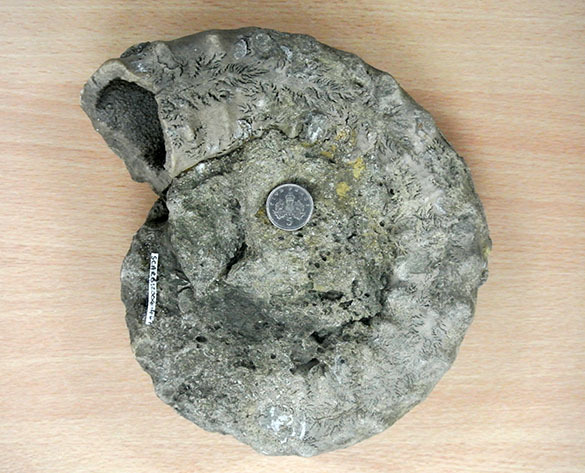 This specimen of the ammonite Peltoceras williamsoni is an example of the kind of material we find in museum collections. It comes from the Passage Beds of the Coralline Oolite — Meredith’s unit. We are not likely to come across such a well-preserved fossil in our short interval of fieldwork. This is not the first Peltoceras in this blog. 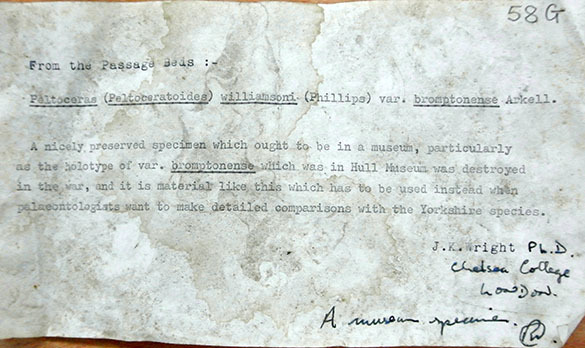 This note that accompanied the above specimen is from J.K. Wright, an expert with these fossils. 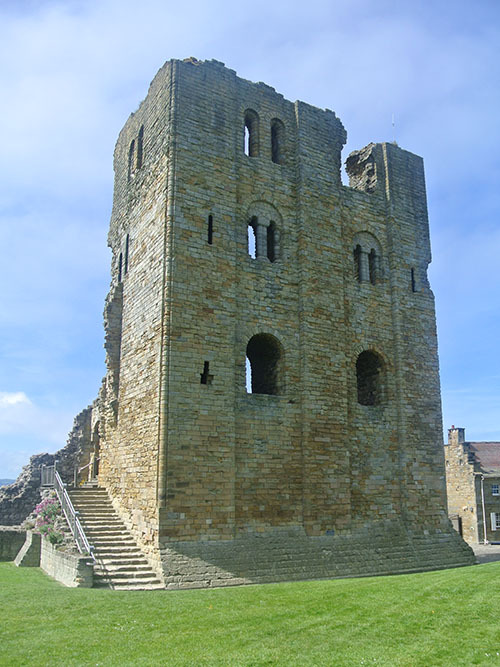 After our museum work, we took an opportunity to visit Scarborough Castle. (We couldn’t do more fieldwork this afternoon because of the high tides.) This is a spectacular place with over 3000 years of history. It was the site of settlements in about 800 BCE and 500 BCE, and then a Roman signalling station around 370 CE. The castle itself dates back to the 12th Century. In 1645 it was the subject of a long Civil War siege, with Parliamentarians on the outside shelling Royalists on the inside. (The cannonades broke the above castle keep in half.) In December 1914, German battleships fired over 500 shells into it. 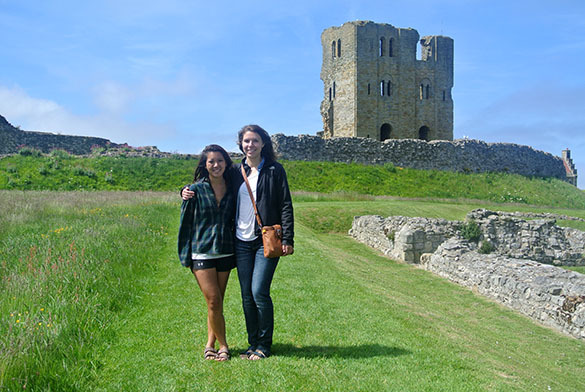 Mae and Meredith with the castle keep in the background. Note the fantastic weather! The remains of St. Mary’s Chapel within the castle walls were built on the site of the Roman signals station. 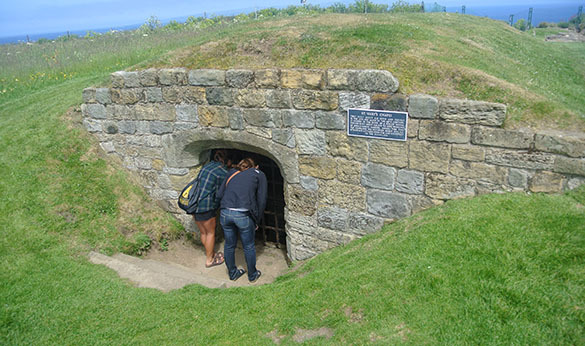 Resident of the castle took shelter here during the 1914 German bombardment. 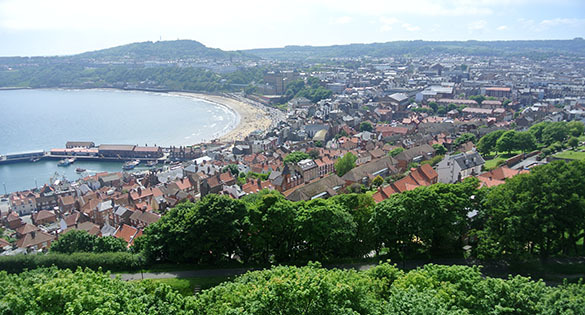 A view of Scarborough from the castle walls. We could see all of our field areas along the coast from this vantage point.